This NASA illustration shows a moon base concept that uses both fixed and inflatable habitat elements to support astronauts living on the lunar surface. This story was updated July 14 at 3 p.m. ET. NASA has launcheda summer contest for students to design the best inflatable loft for life inspace or on another world. A cash reward and a field test of the winning designare up for grabs. Three awardsof up to $48,000 each will be granted to the university student teams thatproduce the best loft-like inflatablespace habitats that can be attached to a hard-shell NASA structure. Thewinner of a head-to-head competition of the modules' performance in the Arizonadesert will earn another $10,000, NASA officials said in an announcement. The X-Hab contest, short for "eXploration Habitat," follows in the traditionof NASA's Lunabotics program and the space-related X Prize awards offered bythe non-profit X Prize Foundation to spur interest in aerospace fields. "Theidea is that the students will be able to learn about teamship,systems engineering, about the future of design for habitat designs, and also innovative technology like inflatable structures,"said NASA space architect and Habitat Demonstration Unit project manager KrissKennedy. "We're growing our next generation of engineers andarchitects. They're actually taking what they're learning in school andapplying it." The contestis sponsored by NASA's Exploration Mission Directorate in conjunction with theOffice of the Chief Technologist's Innovative Partnerships Program. Though NASAhas produced prototypes of inflatable habitats in the past, the space agency nowwants to engage and encourage students. "Studentswill actually be able to be involved in designing and testing these concepts,as we go beyond low Earth orbit," Kennedy told SPACE.com. The winningteam will then try out its design in the space agency's 2011 field test campaignin Arizona, or in a similar set of trials in 2012, NASA officials said. In the past,NASA has testedinflatable habitats in Antarctica to support its Constellation programaimed at returning astronauts to the moon. But since the proposed cancellationof that program earlier this year by President Barack Obama, the ultimatetarget of such equipment designed to foster lunar or Mars exploration is anevolving question. Commercialcompanies have also experimented with inflatable space habitats. The LasVegas-based company Bigelow Aerospace has built and launched two inflatablemodules (Genesis 1 and Genesis 2) into orbit to test systems and technology fora planned privatespace station. 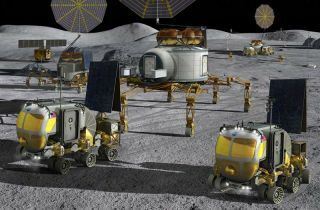 The company also envisions using inflatable modules to builda private moon base, Bigelow Aerospace officials have said. But NASA work still continues. For example, NASA's ActivationMissions Systems Directorate, and the Directorate Integration Office, createdlab work stations this year that could occupy a moon or Mars base. "Right now we're looking at a combination of hard and soft structures ?We're looking at hybrids," Kennedy said, adding that the agency plans totest fixed habitats later this year. "This year we built a core shell thatis a hard structure. It's short and round, more like a tuna can, squat. It'snot like a space station module, that is a long cylinder." A medicaloperations area, and a geosciences lab glove box, were all constructed from ahard shell in contrast to next year's focus on habitats and inflatablestructures, Kennedy said. This report was updated July 14 to include the correct name spelling for NASA space architect Kriss Kennedy.